PURINA ONE Kitten is specifically designed to meet the nutritional needs of kittens (from weaning to 12 months) and pregnant or lactating cats. Kittens have a lot of growing up to do very quickly. Their bodies need to build muscle, be strong and have a fully developed immune system - all in just 6 months. Kittens need correct nutrition for their rapid growth and high energy levels. Similarly, pregnant and lactating queens have special nutritional requirements for milk production and nursing growing kittens. Purina ONE Kitten/Junior, with Actilea formula, meets their requirements, helping to support the development of a healthy immune system, promoting optimal growth and is made with smaller kibbles, ideal for a kitten's mouth. Purina ONE Actilea is formulated with yeast, prebiotics and antioxidants to help support your kitten's natural defences. Dual defence. Visible health for today and tomorrow. High development of vital functions. Healthy development of muscle mass and skeleton. High digestibility. No added colourants, artificial flavours or artificial preservatives. Healthy development of vital functions supported by nutrient profile adapted to the growth phase Healthy development of muscle mass and skeleton thanks to high level of protein and balanced minerals High digestibility thanks to high quality ingredients Oral care for gums and teeth provided by essential nutrients and crunchy morsels Contains DHA, a functional nutrient also found in mother's milk, proven to stimulate kitten's brain and vision development Purina One Kitten is specially formulated to meet the nutritional needs of kittens (from weaning to 12 months) and pregnant or lactating cats. 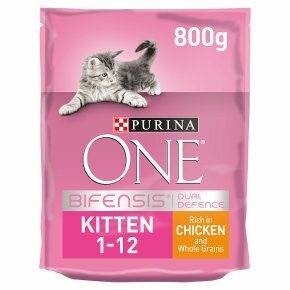 Purina One® Bifensis® is a unique nutritional formula with beneficial functional bacteria scientifically proven to help support your cat's natural defences from the inside out. Developed by Purina vets and nutritionists, Purina One® Bifensis® contains, along with the beneficial functional bacteria, all the key nutrients your cat needs, including Omega 6 fatty acids. Its dual defence formula works in parallel on the inside, by helping to support your cat's natural antibody production, and on the outside by maintaining healthy skin and coat. Recommended Daily Amount (g/day): Cat Age: 6 - 12 weeks, Quantity: 25 - 75 in a 2-3 meals or ad libitum Cat Age: 12 - 26 weeks, Quantity: 45 - 100 in a 2 meals or ad libitum Cat Age: 26 - 52 weeks, Quantity: 100 - 50 in a 2 meals or ad libitum Pregnant cat: min. 80g or ad libitum Nursing cat: 120-250g or ad libitum Should be introduced at 3 to 4 weeks of age. Product should be mixed with water to make eating easier. Increase the quantity as the kitten starts to eat more and reduce the quantity of water added when kitten is able to eat the food alone. Each kitten is different, depending on the kitten activity level and body condition, food amounts and/or time allowed to eat may need to be adjusted. Also suitable for pregnant and nursing cats. Fresh, clean drinking water should always be available.